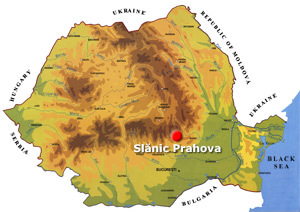 Known as the biggest salt mine in Europe, Slanic Prahova stands today for one of the most important watering and climatic resorts in Romania, situated between the valley of Prahova and that of Teleajen, at about 44 km of Ploiesti, at 400 meters of altitude. Muntele de Sare (The Salt Mountain), unique in the entire world, Grota Miresei (The Bride’s Cave), Baia Baciului (The Shepherd’s Lake), Baia Verde (The Green Lake) and Salina Unirea (Unirea Salt Mine) are just some of the resort’s attractions, which, according to the documents, for more than 300 years represented an important salt extraction center. 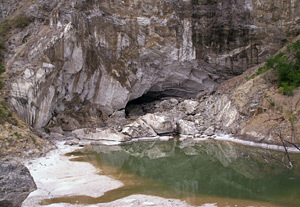 Slanic Prahova – The bride’s Grotto (Grota Miresei). 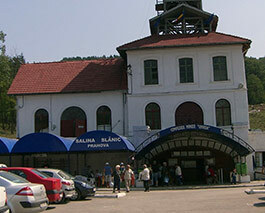 Among the natural treatment factors, we have to mention here The Old Salt Mine (Unirea), which was transformed in a sanatorium, at 210 meters deep, for the treatment of pulmonary diseases in a saline air microclimate; the possibility of having hot mineral waters baths in bathtubs, cold baths in the lake, hot mud applications for gynecologic treatments and for electrotherapy; the mineral waters springs (with compounds of calcium, chlorine, sodium, sulphur) and the lakes Baia Baciului (The Shepherd’s Lake), Baia Rosie (The Red Lake), Baia Porcilor (Pigs’ Lake), Lacul Verde (The Green Lake), with a high concentration of salt, are used for treating some rheumatic diseases. The possibilities of accommodation are multiple, from places in the bathing complex, to villas, pensions and lodging in private homes. 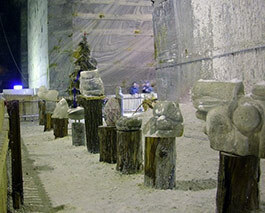 Inside the salt mine from Slanic Prahova. 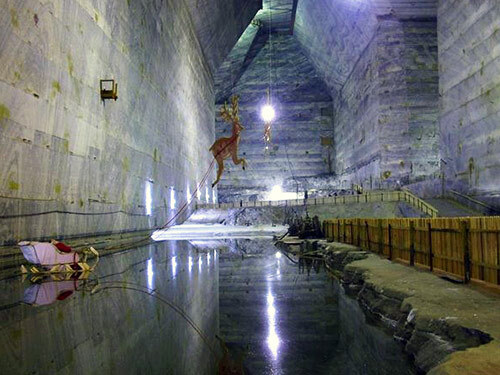 Unique in the country, but also in Europe, the salt mine is formed out of 14 rooms, trapezium shaped, with an opening of 32 meters at the basis, 10 meters at the ceiling and 45 meters height. 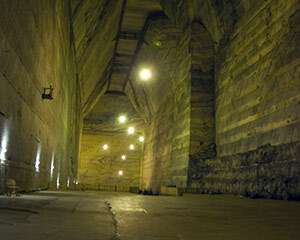 The total area is of 78,000 m2 and the excavated space is of 2,9 millions m3 of salt. 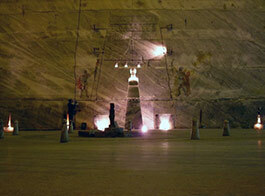 The access in to the mine is done by two elevators that make the transport of the visitors possible. The way down with the elevator is 208 meters long and it lasts almost 3 minutes. The ventilation is naturally made, and the 12 degree C temperature is constant throughout the whole year. The humidity of the air is circa 50% and the air composition in the mine is richer in sodium ions that have spectacular ameliorative and prophylactic effects, what the breathing deficiencies and diseases are concerned. Also, in the salt mine there have been arranged playing grounds, a sports ground, a room with tables for billiards and a bar room. 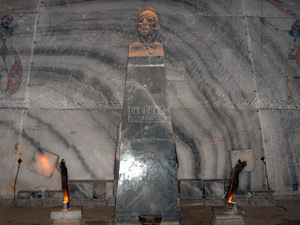 The Statue of Decebal – Slanic Prahova, Salt Mine. Tourists can also admire the statues of Decebal and Traian, carved in salt by the artist Iustin Nastase. Other touristic attractions of the area are represented by Lacul Miresei (The Bride’s Lake) or Grota Miresei (The Bride’s Cave) (425 m2, 20 m deep), formed in 1914 after the collapse of a salt mine, the swimming pools with salted waters from Baia Baciului (The Shepherd’s Lake), Manastirea Crasna (Crasna Monastery) or the Memorial House « Nicole Iorga ». In order to reach Slanic Prahova by car, from Bucharest one has to choose DN1 to Ploiesti, and afterwards, whether the Valley of Teleajen or the Valley of Varbilau and Slanic from Ploiesti. Travelling on the raillway, the route is Bucuresti-Ploiesti-Maneciua, after which it continues on the main road to Cheia – Brasov. 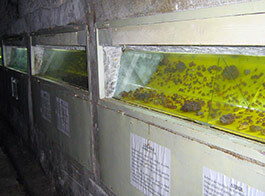 The interior of salt mine. According to the existing documents, the property of Slanic was bought by the sword-bearer Mihai Cantacuzino around 1685. The first exploitation was opened in 1688 on Valea Verde (the Green Valley) and a few years later opened the exploitation from Baia Baciului (The Shepherd’s Lake). Eventually, in 1713, the property of Slanic was donated to Manastirea Coltea (Coltea Monastery) from Bucharest. In 1881 they opened the mine Carol from which the salt was extracted for 61 years, until 1935, and starting with 1912 the mine Mihai was open. Otherwise, in 1912 the mine Mihai became the first electrically illuminated mine in the country, and the year 1931 brought now methods of exploitation by using the explosives and the coal-cutting machines. 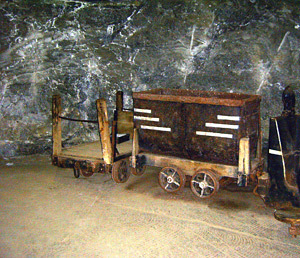 In 1934 they passed forward to a new drift, called Unirea, situated under the mines Mihai and Carol. Then, from 1970 until 1992 they worked at exploitation in the mine Victoria. The mine is visited daily by 400-500 tourists (on weekends the mine is visited by more than 1000 visitors). Free for the children under 3 years old. 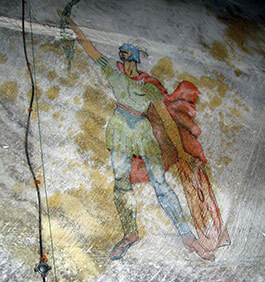 Painting on the wall, Salt mine – Slanic Prahova. hello, can i get your full adress pleasק . i need it for the gps to arrive to the salt mine. thnk you. Hello my husband has asthma and a Romanian friend recommended treatment in salt mines, can I get some information about treatments? Prices? Duration of stay, accommodation options etc is there a direct contact we can make? Does anyone know anything about explatation of salt? and some link where can i inform? I’m from Israel. 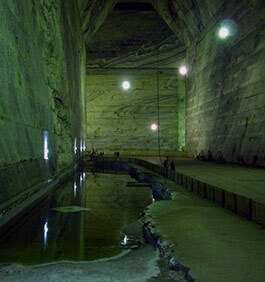 I would like to come for Asthma treatments in the Salt mine. 2) How long does the treament takes daily in order to be effective? 3) What kind of facilities are in the caves for that duration of time? 4) I would like to come either in the Spring or in the Automn (when I suffer the most), what dates are advisable? 5) My husband (who is a Romanian) will join me. Are there any attractions for him in the vecinity area??? I know that mine (is about 20 km from where I live) and I can give anybody free info and guidance. 1. 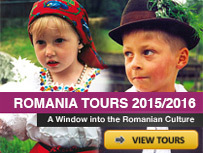 Rd Impex, departure from Calea Grivitei (CFR Museum) at 8 am and 2.30 pm, going back to Bucharest at 11.15 am and 5.45 pm. I do not know the price (I think around 20-25 RON one way) because I was not able to take this bus. On Sunday it was fully booked. Phone numbers: 0744 392 405, 0768 040 029. I would advise to call them before the departure in order to make sure that the bus will come and you will have a place there. P.S. do not trust autogari.ro website which states that the departure is from Basarab. IT IS NOT CORRECT! 2. You can take a bus from Basarab station to Valeni de Munte and from there go to Slanic. There are many buses going there (search for the route Bucharest – Cheia on autogari.ro, Valeni is the station in between, however, if you type Valeni in the search box it gives you no results, thus, search for Cheia instead. The schedule Valeni – Slanic: Mo-Fr 6.00 8.00, 10.30, 12.30, 16.00, Sa-Su 8.00, 12.30, 16.30. Slanic – Valeni Mo-Fr 6.30, 8.45, 11.15, 13.30, 16.40, Sa-Su 8.45, 13.30, 16.40. Price Bucharest – Valeni is 16 RON one way, Valeni – Slanic – 5 RON one way. I managed everything in one day and, in my view, there is not need to stay overnight there. Hope that helps and good luck! Is it possible to get to the mine by train rom Bucharest? Is it possible to see the mine and some other attractions in one day and get back to Bucharest or do you need to stay overnight in Slanic Prahova? Can you tell me how to purchase the salt and humidifier for sale at the mine? Amazing … I just visited it today …. Impressing! Is there a salt-shop beside the salt mine, where we can buy original salt? How much costs 1 kg of Prahova-salt? I am 53 and have asthma. Please can you tell me more about the asthma treatment you offer. How many treatments are needed and for how long each time? Is there accommodation nearby? Thank you. Can you please tell me , How far is the salt mines from Bucharest, Romania? And can you tell me more information about the opening days and entry times and also the ticket price. pentru localnic—pentru o familie(4 pers) pentru o saptamana cat ma poate ajunge cazarea (perioada 09/08/2009-16/08/2009) la pensiuni sau particulari? You can stay in Slanic at Casa Padurii / 3* (www.casapadurii.ro) or Hotel Roberto 3* (central) those are the best places. I want to come Slanic for asthma treaatment for my girlfriend. Could you send me information about treatment procedurs, prices,the time for the best results and where we can stay in Slanic? where is the best hotel and place that i can stay in slanic and that can make treatment. what is the opening days and hours of the salt mine and how much the enteriee fee. Hello, I want to come Slanic for asthma treaatment for my mother. Could you send me information about treatment procedurs, prices,the time for the best results and where we can stay in Slanic? What is the openning days and hours of the salt mines ?